Eric Wayne: artist, critic, philosopher, fool. BA (Studio Art): UCLA ~ but I like to think of myself as self-taught anyway. 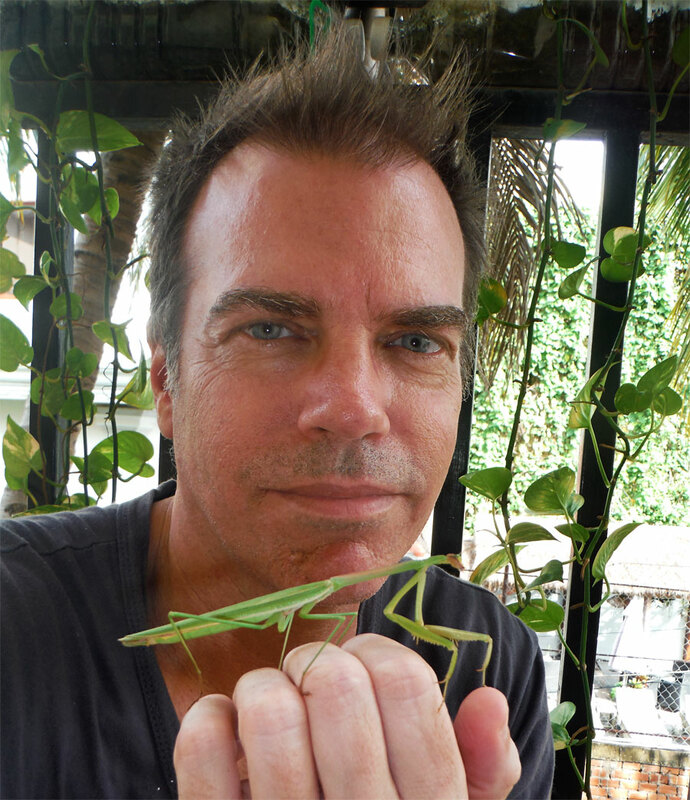 Mantis and me, October 15, 2017. My goal is to make captivating, challenging, beautiful and novel images for the collective imagination: to see the unseen and bring back artifacts to share. I combine traditional drawing/painting techniques with computer software (including photo-editing and collage techniques…) to revitalize the long tradition of painting into the digital age. I am a pioneer in fine art, painterly, digital imaging, with one foot in tradition and the other in restless experimentation. I’m especially drawn to the marriage of seemingly inconceivable opposites, such as digital & impasto, sci-fi & expressionism, tragedy and comedy. While my graduate education was in contemporary conceptual art, and I am well acquainted with that paradigm and its lessons, my real passion is for the still image, which is its own rich avenue of non-verbal communication. My main influences are the more painterly side of art history, vintage sci-fi, psychedelia, Surrealism, Expressionism, and Realism. Because I am drawn by curiosity and discovery, and well versed in conceptual practices, I work in more than one style simultaneously, constantly elaborating new variations and hybrids. There is a strong continuity between most my pieces, however, in terms of working from the imagination and frequently employing a very painterly aesthetic. In terms of content, I consistently explore the terrain of the imaginary, the subconscious, altered states of consciousness, the relationship between self and other, existence/death, and the perennial grappling with the predicament of the human condition. In short, I’m trying to excavate, hone, and manifest my psyche and reality in visual form. 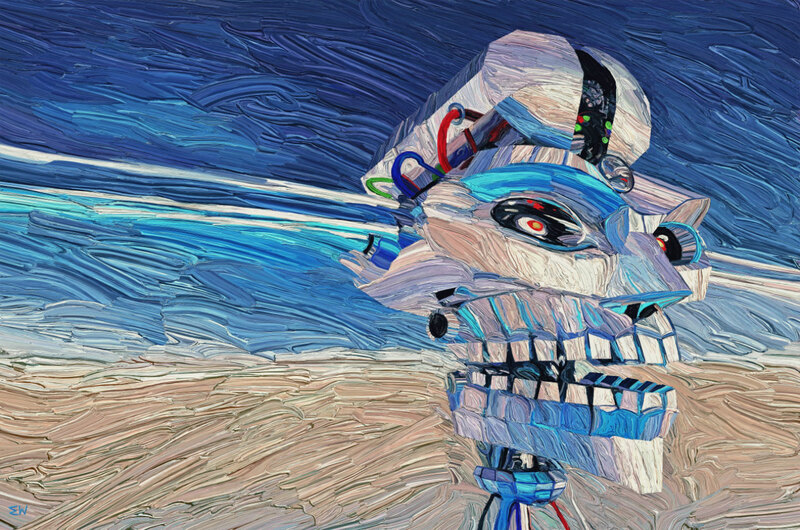 “Awakening of AI” by Eric Wayne, 11-2016. [24X36″ at 300 dpi]. Customarily I work about as large as my computer can handle it so that hi-rez, gallery quality prints can be produced. Here’s a close-up to give a sense of detail and scale. 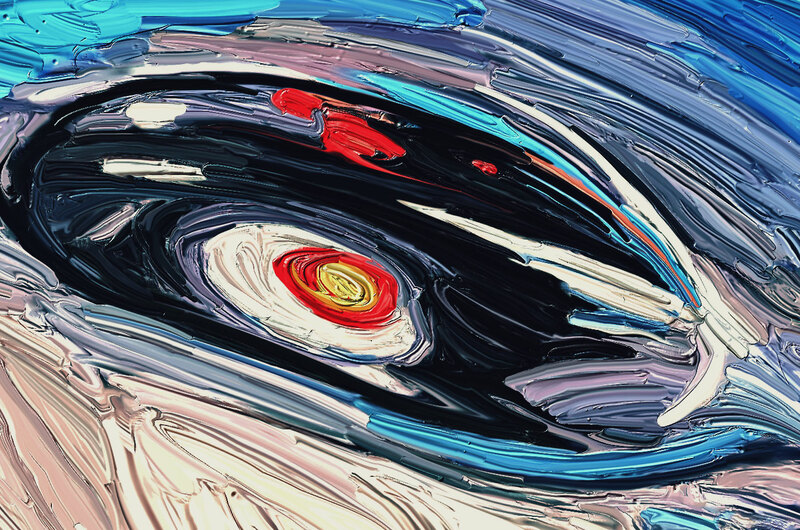 Detail of the eye showing one of my custom digital impasto techniques. While I consider myself an artist first and foremost, many people visit my blog for my art criticism, and several of my articles have gone viral. I’ve published over 50 feature articles on art criticism and related topics, and over 500 posts in total.